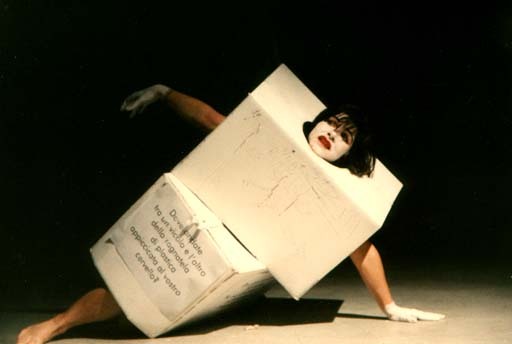 Polypolis project consists of the same performance made in different European Cultural Cities Capitals in 2000. The performance is called The winning mummies. The winning mummy is a person who thinks to be socially successful and a winner, but his life is completely suffocated by prisons of duties, conventions, hypocrisies and stress. The result is a person that in his core is dead like a “mummy” but he mostly does not realize this. 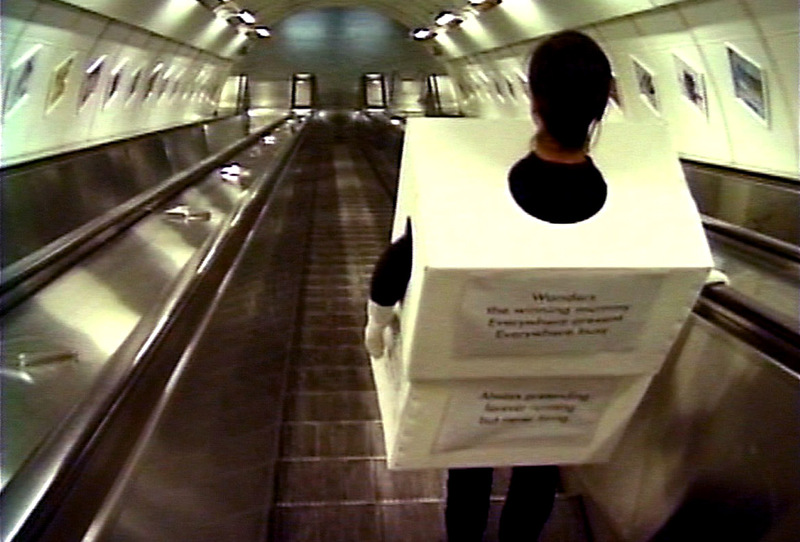 The aim of the performance, in which LIUBA walks through streets in the daily-life of several big cities, while blocked in by two big boxes, is to show in a visible way our invisible daily life, contricted in pressures and prisons, raising reflections and questions. The deep roots of this project began from the consciousness of the emptiness that grows in our cities, always more homogenized in a way which is devoted to appearance, business and superficiality. 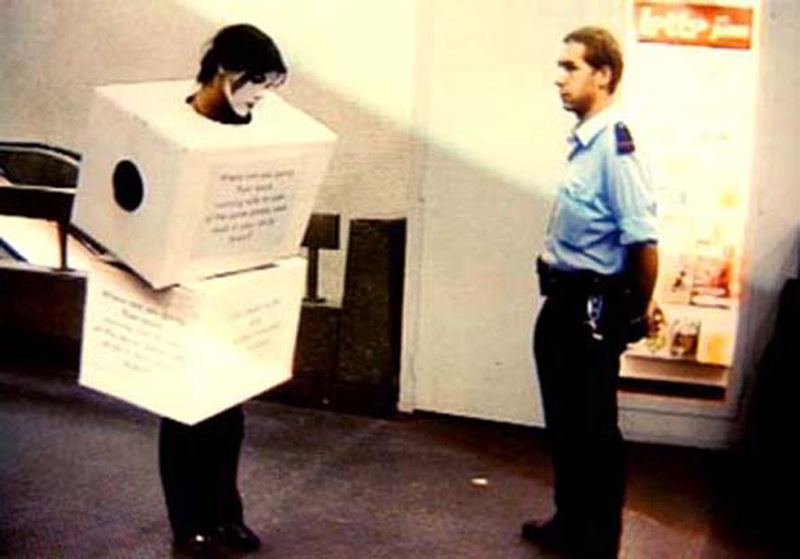 In the middle of the crowd it might be easy to perceive that many people are really sealed and tied in life-style boxes, always busy going on purposeless quests. The performances have been filmed and edited to create 5 DVD videos that show the reactions of the people to the performance: Polypolis Brussels, Polypolis Prague, Polypolis Avignon, polypolis Bologna, Polypolis Frankfurt. 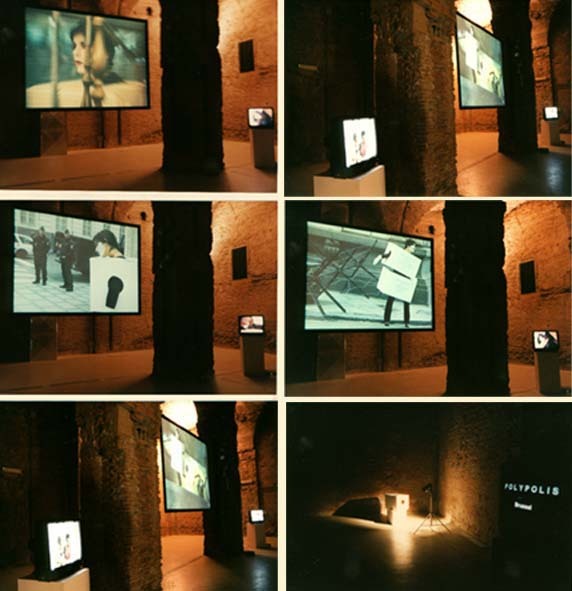 The videos are autonomous works, but they also are conceived to be projected together at the same time in a video installation, so that every video reflects the different reactions of the people and shows the identities of each place. 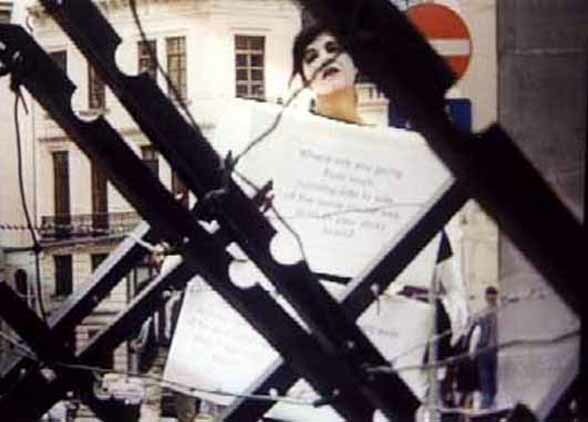 The performance took place in Brussels on a day that the city was paralyzed by the strike of truck drivers who had blocked all the main roads of the city. This coincidence has occurred by chance, since the strike coincided precisely on the day in which LIUBA was in Brussels, along with his cameraman, to do the performance. The city, blocked by truckers, was manned by armed police scattered everywhere, and the roads, unavailable to cars, were filled with people, lost and surprises, trying to reach their jobs and commitments by feet. This randomness has interfered with the performance, and it has also accentuated and dramatized the content. The video result is also the portrait of Brussels in a new dimension. The city is almost surreal with huge avenues blocked to traffic, sit in of trucksdrivers and police everywhere. The performance in Avignon was made in the evening, finding a surprisingly deserted town in the early evening of a summer day. 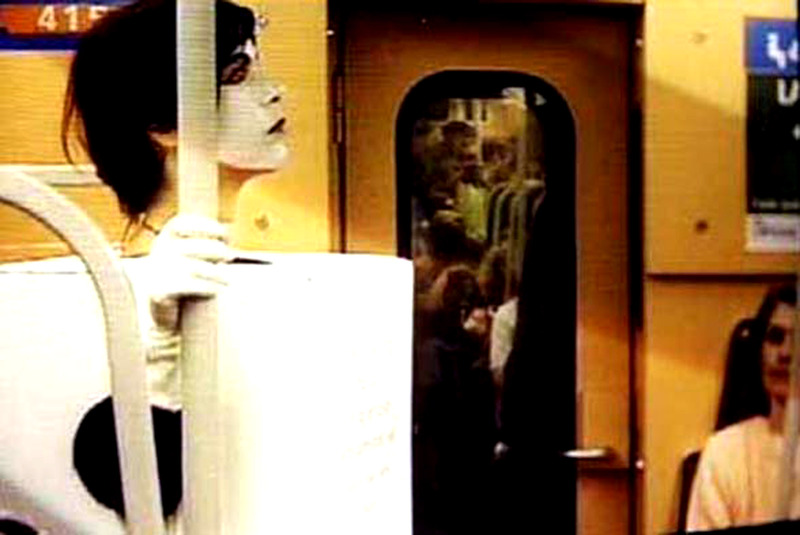 The city’s character emerges clearly from the video and the reactions of the people. In Bologna, which is a University city par excellence, with the oldest University in Europe, LIUBA performed in the areas of the old town, with many students’ interactions, and various stories, but surprisingly once the performance was stopped … by the Academy of Fine Arts! 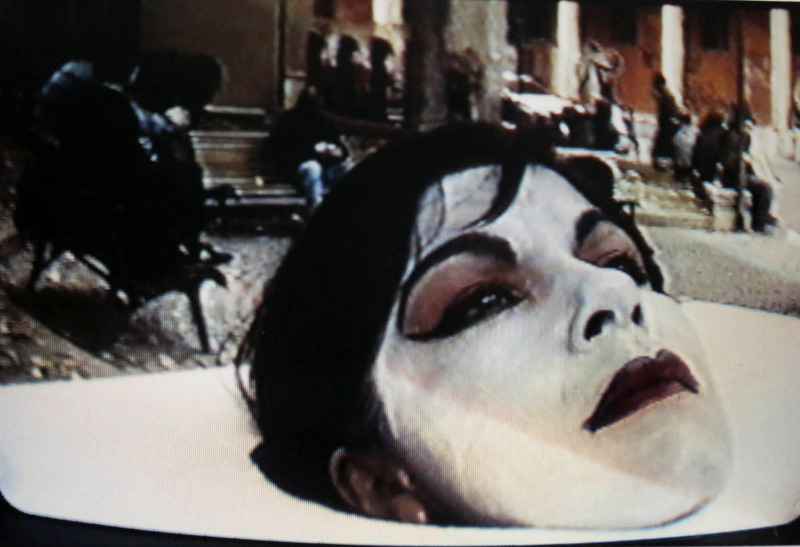 The performance in Frankfurt was made during the trip in which LIUBA and her cameraman Ciro d’Aniello were traveling around Europe for the Polypolis performances in the European Capitals of Culture in 2000. 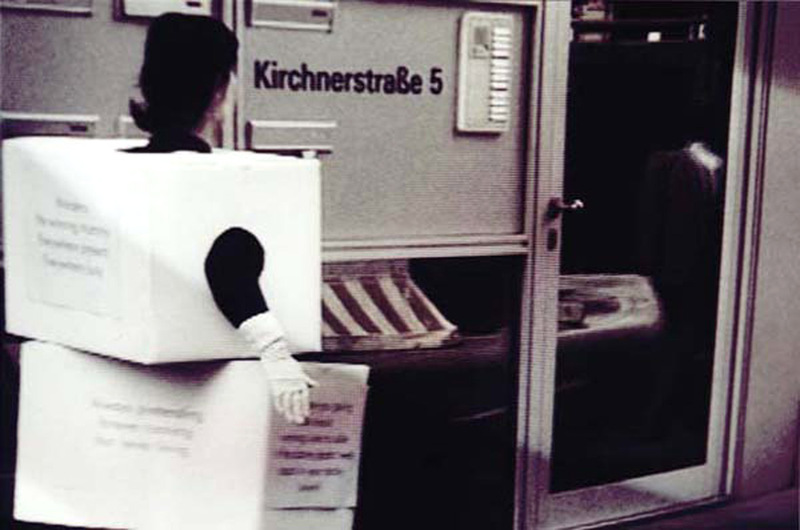 Although Frankfurt was not among the capital cities of culture in 2000, the artist considered it important to include it in the series, going for the performance in the area of the stock market and banking, symbol of German efficiency. 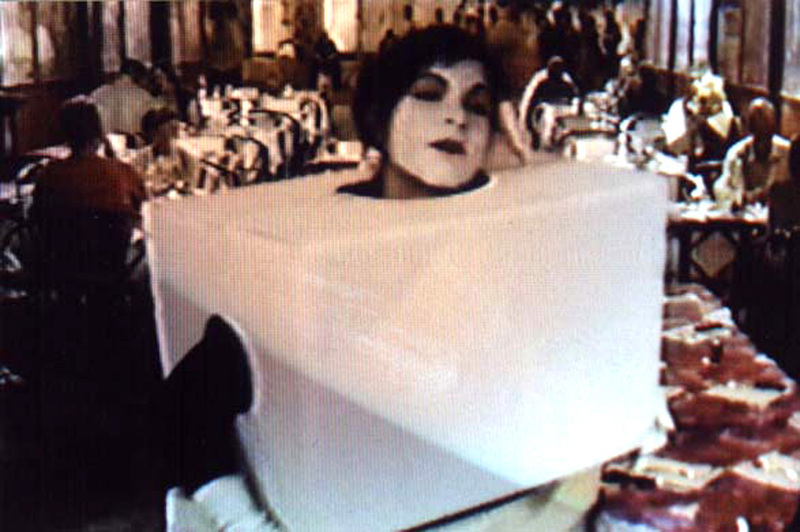 The video from this performance was edited in 2002, and is part of the full project. Il disagio sociale ed il bisogno forte di rivolta e riscatto sono le prerogative del lavoro di LIUBA. Oppressione: questa è la parola chiave che sta alla base delle azioni performative che attraverso lo sconvolgimento dell’ordine imposto ci portano a riflettere sulla nostra condizione di uomini. 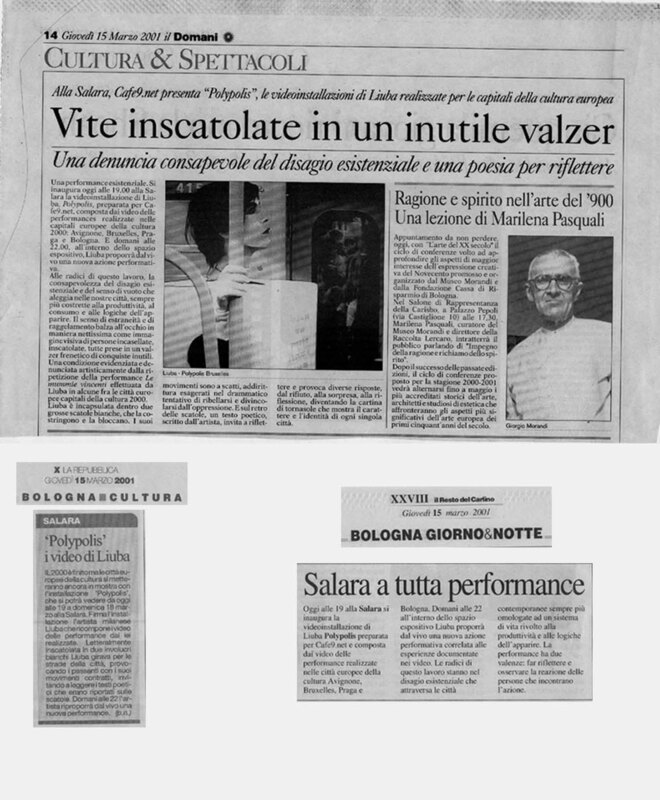 Polypolis, che si è svolta nelle quattro Capitali europee della cultura 2000 (Avignone, Bruxelles, Praga e Bologna) si inserisce appieno in questa poetica fortemente sociale. Le metropoli sono lo sfondo della nostra vita, rappresentano gli spazi alienanti nei quali svolgiamo le nostre attività produttive, attraverso iterazioni basate su codici radicati nei secoli, che eliminano la nostra individualità. Siamo costretti ad indossare maschere, le stesse che LIUBA attraverso le sue performance ci costringe a togliere. 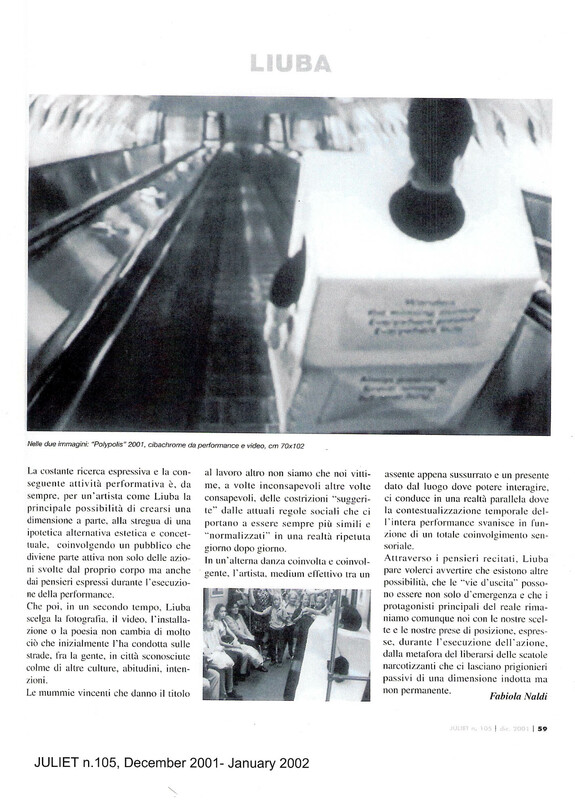 L’azione si svolge nei confronti del pubblico, l’artista inscatolata in enormi strutture di carta passeggia per le città, nelle metropolitane, entra nei caffè, interagisce con i passanti ignari. 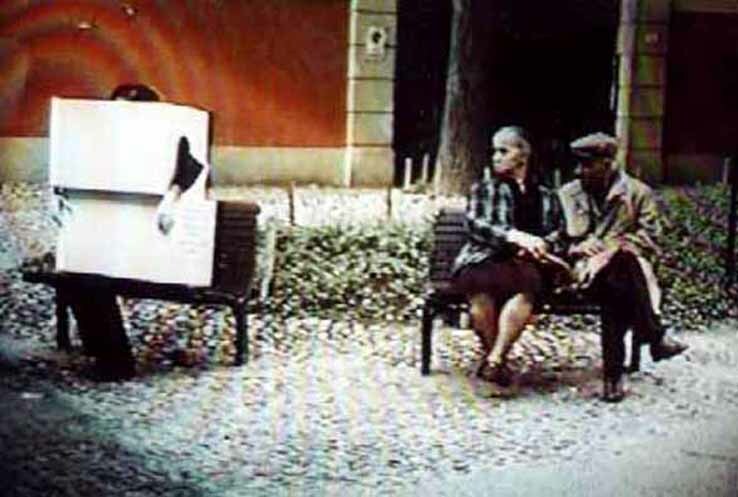 Ciò che colpisce sono le espressioni, i visi delle persone esterrefatte a cui viene sconvolta la normalità o meglio il codice imposto di comportamento. Le scatole di LIUBA rappresentano appunto tutto quel sistema, tutte quelle sovrastrutture (convenzioni, doveri e stili) che pur dandoci il senso della realtà sono lontane dalla nostra anima. Il viso dell’artista è dipinto di bianco perché lei stessa si priva della propria identità per diventare il simbolo di un’umanità stereotipa. I gesti e le espressioni sono esagerati e volutamente carichi di finzione; essi rappresentano in maniera grottesca i nostri comportamenti quotidiani sublimandone gli aspetti peggiori.